Bitcoin is looks to test the 2018 lows. Technical story is bearish. The price of bitcoin on the Coinbase exchange is down about -$140 on the day at $3581. That is getting close to the lows from November at $3508 and $3456. Technically, those levels could/should provide support, but overall the bias is still more bearish. Last week, the price was able to get above both the 100 and 200 hour MAs (blue and green lines) after being below since November 10th. That should have solicited more corrective buying, but instead, the momentum faded and the price moved back below. On Tuesday, there was an ever so brief attempt to get above both the 100 and 200 hour MAs, but that attempt failed on the hourly bar. BEARISH. If the price cannot get and stay above the 100 and then 200 hour MAs, the bias still tilts to the downside. 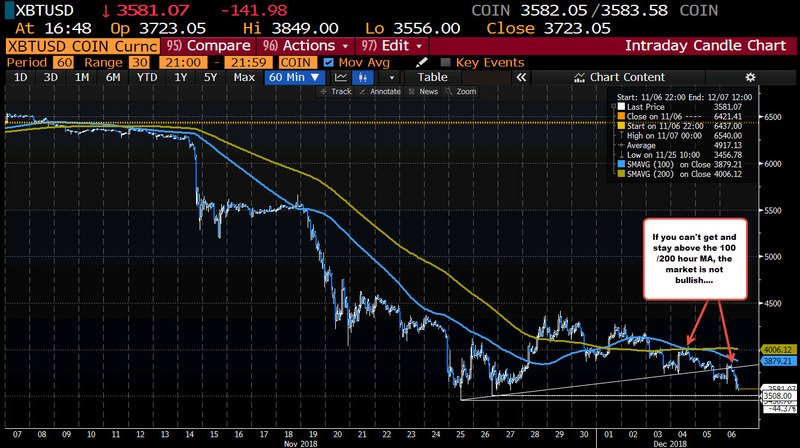 In a volatile instrument like Bitcoin with the "fundamental story" mixed (at best), the price action and technicals tell "the story of the market" (i.e. what the buyers and the sellers really feel). Stay below the MAs and the storyline is more bearish.